Constructed in 1902, the Irma was built by none other than Buffalo Bill Cody who named it after his daughter. Indeed, he kept an office and a couple of suites here for himself – “just the sweetest hotel that ever was”, he opined. 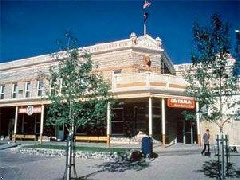 Other famous names from the wild west are reputed to have visited the building, most notably the premiere ladies of the American frontier: Calamity Jane and Annie Oakley. Those with a passion for heritage will no doubt prefer the “Historic Rooms” to the standard guest bedrooms, although owing to the relatively small number of the former the hotel cannot guarantee their availability.